Koh Phangan information > A bit of Real Rainy Season in the Gulf of Thailand! 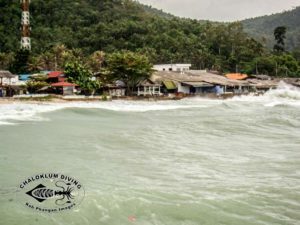 For the last few days we’ve had some authentic rainy season conditions on Koh Phangan – proper waves crashing on the beach, a serious wind blowing through the dive centre, a thoroughly bad-tempered cat, plus some torrential rain for good measure. The diving school stays open as ever, but it’s more for the PADI pro’s to socialise, complain about the weather and enjoy an excellent noodle soup from Mr Chai across the road – thankfully he is still open! Michael has just about finished with the diving equipment maintenance for this year, and Michi has actually serviced his regulator – that trip to Laos has obviously motivated the man! Jan is waiting for the rain to stop so that he can play with his new toy – a monster yellow Honda scooter for “easier visa runs” – but do we really believe him? And with a high season approaching we are expecting the arrival of some new Chaloklum Diving team members in the next weeks – more to follow in our next update. Finally, it looks like we are starting on a long planned gastronomic project for our big boat (again, more news soon…), and we’ve actually had the chance to put in some time on the Koh Phangan Marine Life Guide – we now have over 4,700 underwater images uploaded, as well as a previously unrecorded pufferfish and a new species of flatworm – who ever said that rainy seasons were boring?! Kung & I wish you, your family and the team a happy festive and a successful high season. Just planning my next big bicycle ride: Will arrive at KP about Feb. 18th. It will be good to see you man! Lek, Lucy, Louise, Nick & the team.